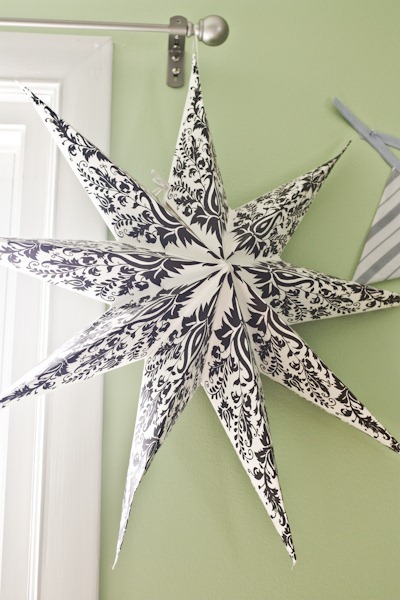 I’ve had this paper star floating around the nursery – and our house – for a long time. I’m just not sure what to do with it! Should I hang it over the crib? I wonder if it would feel a bit sparse just the single star in the center? Does the black and white go? I’ve heard that babies like black and white. Also, forgot to include this book in our collection! 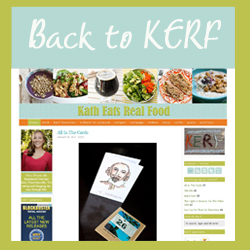 Amelia gave it to me last fall – before I was pregnant!! So very appropriate! That’s a really pretty star!! 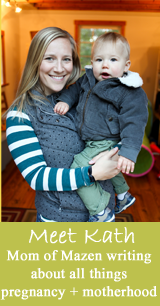 My son noticed patterns and fabric textures really early on so I’m sure your little guy will love it. I love those types of stars. 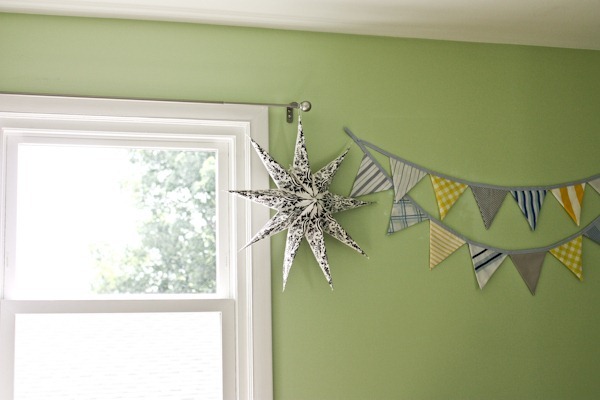 If you’re not sure about putting it in the nursery, what about hanging it out on your screened porch for a decoration?? So happy to see you already have a book collection going. Reading to my children is one of my favorite things to do with them! Cute star. Right under the flags in the center would be cute! I have a big book collection already, a lot of them hand me downs and my own childhood books, and I can’t wait to read them to our little guy! I love it! Where did you get it? It would look perfect in my sitting room. Hi! This is my first comment but I have been a reader of yours for awhile. Congrats on your baby boy! I used to work at a baby boutique and we sold Wee Gallery art cards that are black and white. 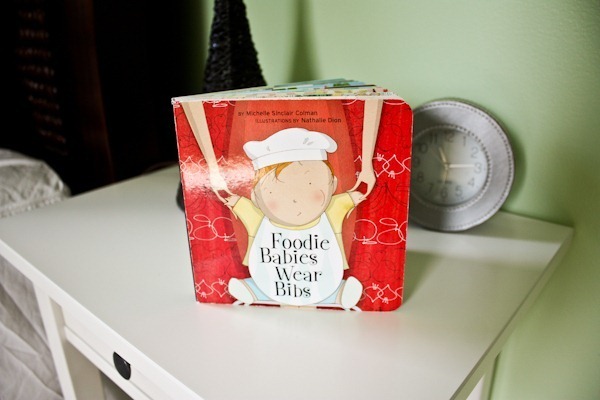 I have heard mamas putting the cards in the crib or hanging them as a mobile. The babies love to look at them! 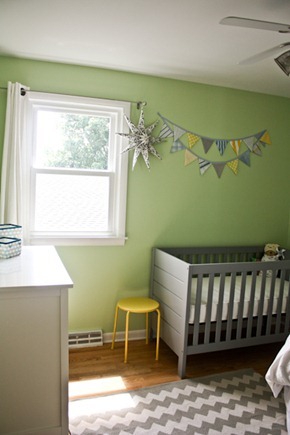 Hanging it from either of the fan chains would probably be most noticeable for your baby to see. 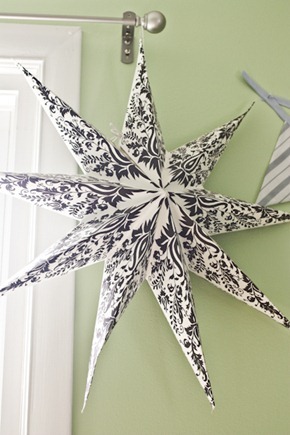 If it was over the changing table I would want to hang it so the star hung flat versus the point hanging down. That way your baby would see more of the black and white pattern. Nursery is looking very good. Babies, especially newborns – 12 months love the black and white patterns. Learned all about it in my Early Childhood program in college. It is stimulating for them to look at. There is a baby board book called “black and white” (forget who it is by) that is all sorts of shapes/designs in black and white. It was popular with all the babies I took care of in a daycare setting, as well as the one I nanny for (who is now 9!!). 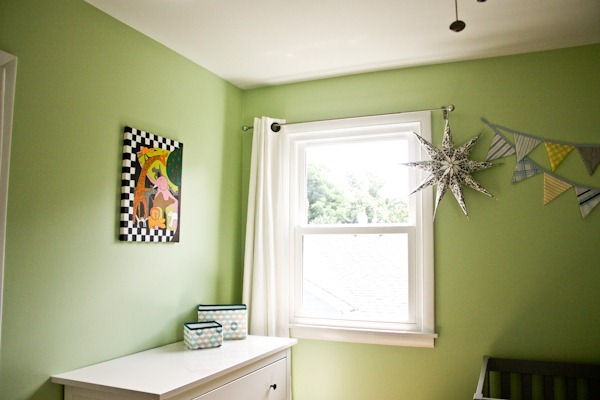 I would hang that awesome star over the changing table area. And if you don’t do that, I’d set in on a mantle or shelf for decoration! Hey Kath! 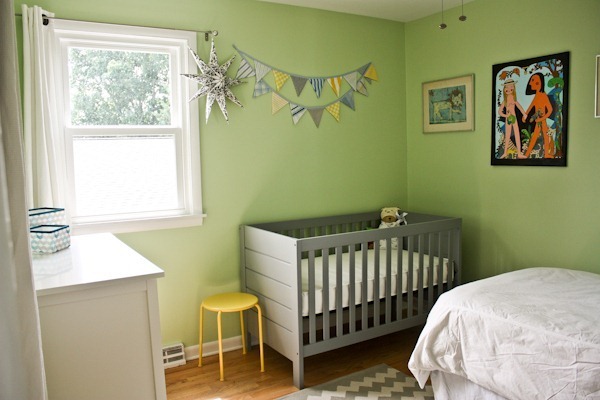 What a beautiful nursery–I love the colors. I also really like that Adam & Eve type picture hanging on the wall. Do you know who it’s by? Oh, wow! That’s so wonderful! It’s a beautiful painting. Maybe you could hang the star over the crib somehow like a mobile or something. I can’t remember what you have hanging above the headboard on the bed, but the star might look appropriate centered above the bed. Just a thought! I already put them on my registry! p.s. haven’t had time to check the blog in awhile – the nursery is looking beautiful, as is your bump!